Mortenson says it expects construction costs to rise in Chicago by four per cent this year. The contractor said in releasing its quarterly Construction Cost Index for Chicago and five other major metropolitan areas in the U.S. that the markets are experiencing steady construction activity and employment with indications of continuing strong growth in certain areas. Mortenson says the cost index for Chicago increased 4.3% throughout 2016 and experienced one of the strongest quarterly growth rates (Q3 2016 – Q4 2016) over the last several years. Construction employment ended the year relatively flat. Other markets included in the index include Denver, Milawukee, Minneapolis-St. Paul, Phoenix, and Seattle. According to the report, Mortenson recommends that building owners should anticipate non-residential construction costs in the six markets to increase 3% – 4.5% in 2017. Overall construction costs increased 2.7% – 6.1% across these same markets last year. While the rate of growth in construction employment has plateaued in several of the markets tracked, the non-residential construction labor market is considered healthy according to employment data from the Bureau of Labor Statistics. The Mortenson index also tracks building component trends in 30 categories across all markets with many component prices flat to up as much as 8.4% in the fourth quarter of 2016. The Mortenson Construction Cost Index is calculated quarterly by pricing representative non-residential construction projects in various metropolitan areas. It is part of a portfolio of industry insights and market studies provided by Mortenson. 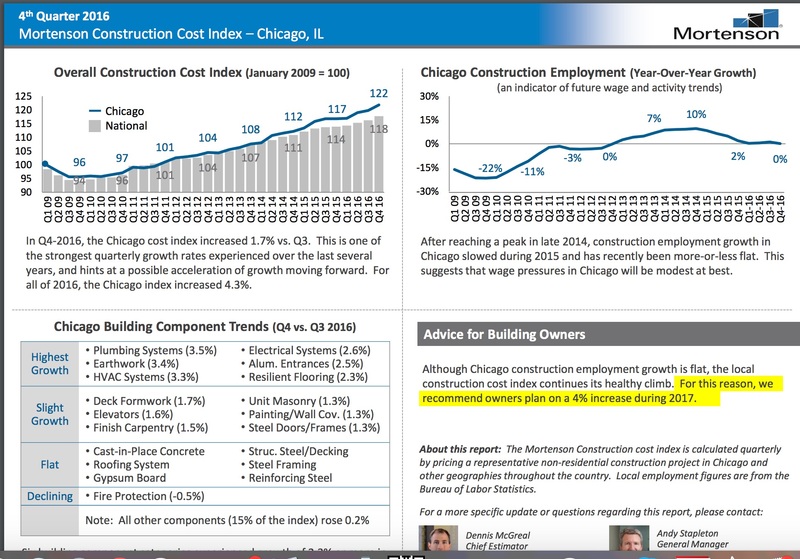 The Construction Cost Index is available for download at http://www.mortenson.com/cost-index. A podcast with more insight on the topic is also available at http://www.mortenson.com/company/news-and-insights/bwn-q4-2016-cost-index-podcast.